Silverleaf is a new private real estate neighborhood within DC Ranch, encompassing 8,300 acres, with more than 4,600 dedicated to open space. It includes an enclave of large estates featuring only 700 homes among 2,000 acres. Silverleaf is adjacent to the full range of DC Ranch real estate community amenities. The Silverleaf Club in Scottsdale is a private, non-equity club available to Silverleaf property owners, featuring a Tom Weiskopf Signature 18 hole championship golf course. The 50,000 square foot Silverleaf Club and Spa will contain world-class spa facilities, resort and lap pools, locker rooms and golf lounge areas as well as fine and casual dining. 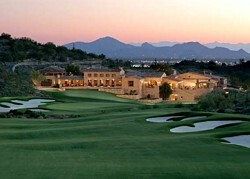 The Silverleaf Club Golf Membership is separate from property ownership.